As the main line tour progresses I have been doing a lot of thinking about the direction of my blog posts during my seemingly endless research on the physical plant of the former Pennsylvania Railroad. In the process of producing this tour I have been ignoring a large part of the project, the towns the railroad traveled through. These places large and small developed around natural resources and manufacturing, much of which revolved around iron and steel production. The landscape of Pennsylvania, Eastern Ohio and West VA first began expanding because of natural and man-made waterways, which provided industry with a means of transportation to expand their markets. Though a major advancement, canals and rivers were subject to seasonal changes shutting down shipping with the winter freeze and summer droughts. It quickly became evident that a better mode of transportation was needed and the railroad was the answer. Politicians, lobbyists and industrial magnates fought for access to prime locations, rail lines were chartered, built and continually improved through the late 19th Century. As a result towns along the railroad boomed, people were no longer in isolated communities but part of an industrial chain that drove the American economy. With the new ability to move large quantities of raw material and finished product across the country the steel industry expanded and so did the need for labor. Immigrants came by the thousands to places scattered across the region to work the mills, mines and for the railroads. The ethnic diversity was reflected in the various churches, neighborhoods and shops that brought the familiar comforts of the old country to this new place of work. 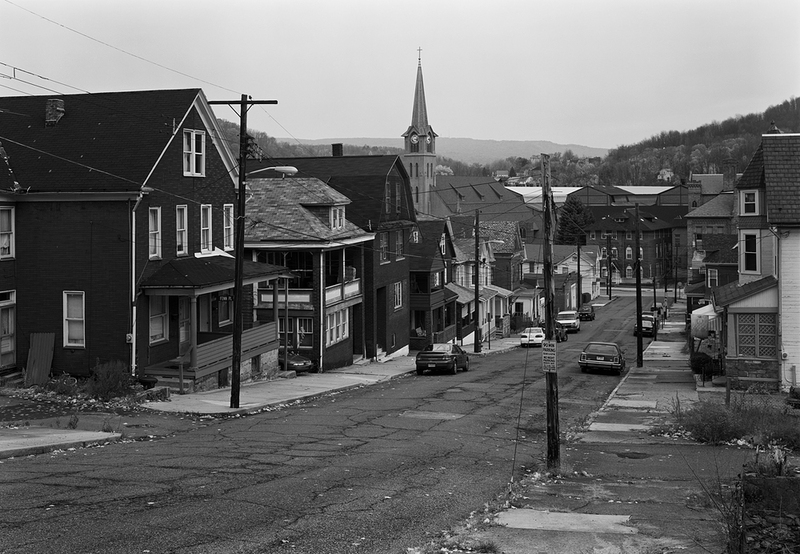 Throughout the years there have been high times and lows in many of these towns, rocked by labor disputes, natural disasters and the eventual decline of the American steel industry. 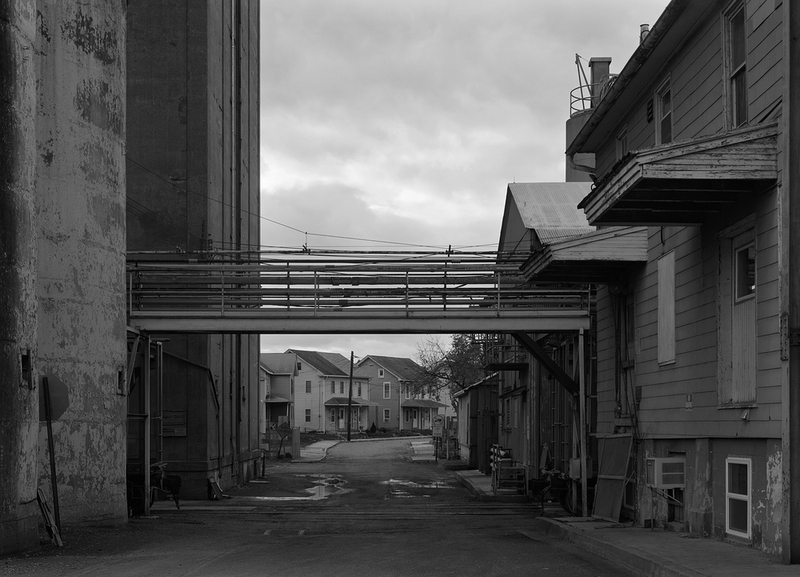 The view from Singer Street in Johnstown, Pennsylvania exemplifies the somber beauty of mill towns across Pennsylvania. Homes cling to the hillsides and business districts look toward the mill, once the focal point to the local economy. Today countless places like Johnstown are a quiet memorial to the era of steel and manufacturing across the region. Today many of these places serve as a monument to industry and a way of life that has disappeared. The villages, company towns and entire sections of cities often look onto the mill, celebrating the pride and prosperity these now abandoned places once provided for many hard working families. 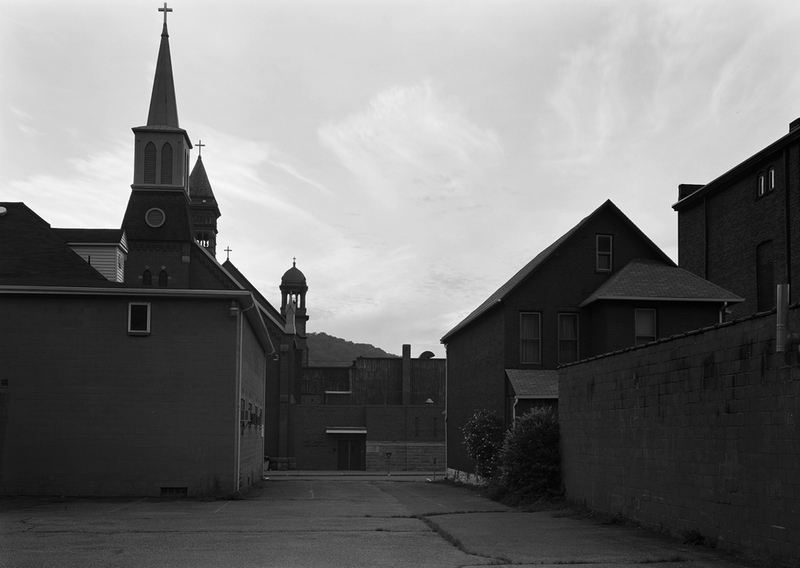 I have found myself completely entranced by places like Johnstown and Braddock, places that are a fraction of their former self, wondering what it was like when these places were in their prime. In residential areas there is little uniformity from house to house with the exceptions of clusters of company housing yet all of these places look oddly the same. Frame houses on hill sides, all slightly modified over the years or just plain neglected, empty streets and brown fields, virtually deserted town squares flanked with grand commercial buildings constructed of stone and terracotta, town by town the theme repeats. 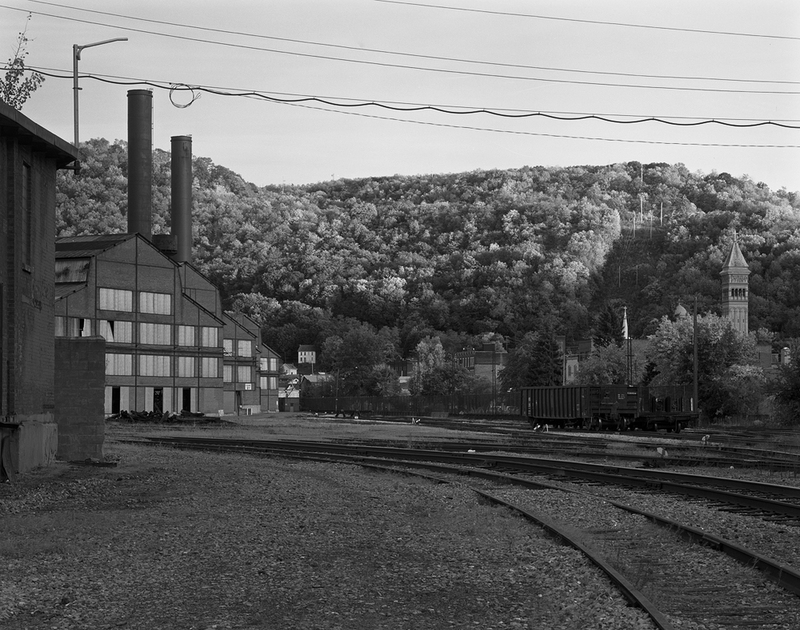 East Conemaugh was situated across from the Franklin Works of Cambria Iron, later Bethlehem Steel. 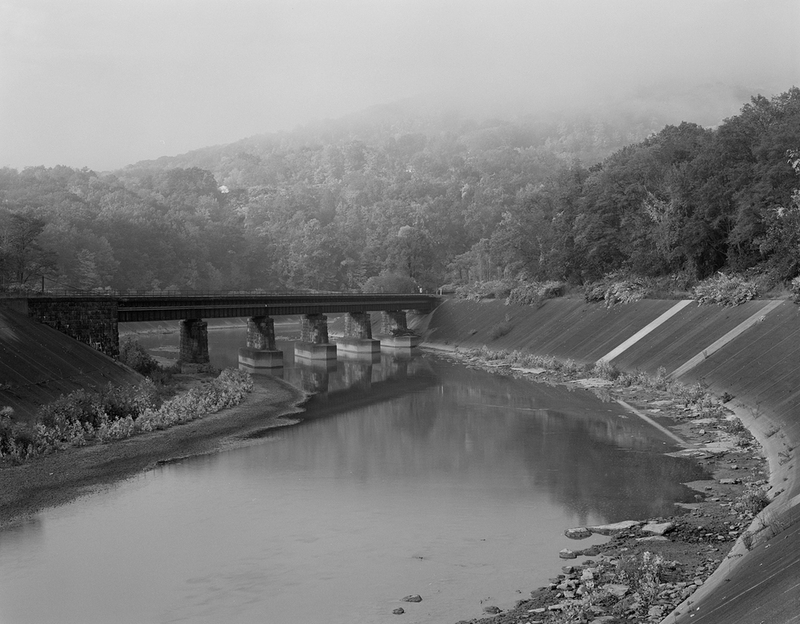 The mills are gone and the rail yards empty, the Main Line of the Pennsylvania Railroad still enters town on the far side of the Conemaugh River, the final resting place of engineer John Hess who used his locomotive whistle to warn the townspeople of the impending destruction of the great flood of 1889. Like much of my work, this imagery is an observation, part of connecting the dots to understand a particular place or landscape. To many its a bleak and depressing place, I am often asked why bother visiting let alone taking pictures, some locals even get mad that an outsider would objectify their struggling community. To me the typical mill town is a comforting and familiar place, one of repetition and rhythm. You can find something different in every visit, grand and ornate homes in a row of company buildings, five story apartment houses in a town that doesn’t even rate a gas station, and the rail line that once fed this industrial giant snaking along from town to town. This is where the Main Line of the Pennsylvania Railroad once travelled, the towns it built, nurtured and its predecessors served until the industry dried up. The railroad still thrives but like many places, the trains don’t stop here anymore. The mill town is a place of beauty in its own right, and I am happy to have experienced every one of them and look forward to sharing a different viewpoint of the built landscape that came as result of the railroads and industry. Over the coming months you can expect images celebrating these places as work continues on understanding the late Pennsylvania Railroad and the landscape it travelled. Enjoy! From modest beginnings with a commission for the Coleman family in the iron rich hills of the Lebanon Valley to becoming one of the most important American architectural firms, McKim, Mead and White began building its legacy in the village of Cornwall, Pennsylvania in 1880. Stanford White's first commission with McKim, Mead and White was Alden Villa. This interior detail is of the foyer and main staircase. Cornwall, Pennsylvania. It all began when a 25-year-old Stanford White set sail for Europe to visit his long time friend, the American sculptor, Augustus Saint-Gaudens in 1878. White had been working as the head draftsman for the noted architect Henry Hobson Richardson, where he had befriended Charles McKim. McKim left Hobson in 1872 looking to develop his own firm joining William Rutherford Mead and later in 1877, William Bigelow, McKim’s brother-in-law to create McKim, Mead and Bigelow. In short time during the course of the partnership with Bigelow, McKim’s marriage failed and as a result Bigelow left the firm. Looking to fill the vacancy McKim joined White at the last minute traveling to Europe in an effort to recruit him to join the firm. Their trip to Paris would be an inspirational time and upon their return, White came on board with McKim and Mead to create one of the most prolific firms in American history. 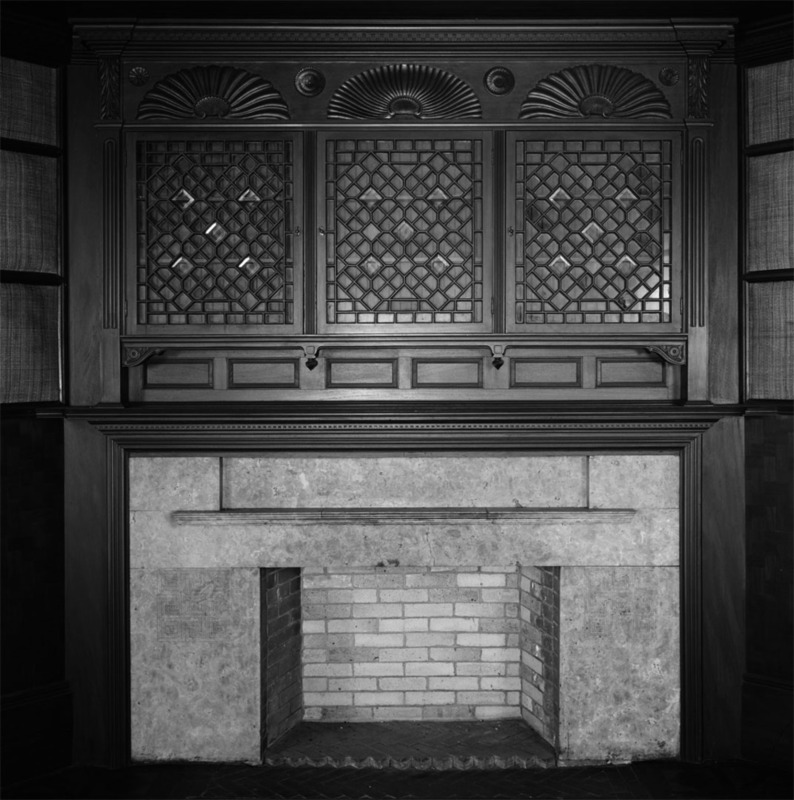 Though McKim was already on his way to being well established and White had a great deal of creative freedom under Henry Hobson Richardson on account of his ailing health they would now be able to fully express their creative aesthetic under the auspices of McKim, Mead and White. Shortly after starting the firm, White began work on what is arguably his earliest residential commission, a project with Ann Caroline Coleman in 1880 to construct a home for her son Robert Percy Alden and his new wife Mary Ida Warren in the iron hills of Cornwall, Pennsylvania. Some have theorized White was given the commission because of his status as junior partner having to make the lengthy trips from New York City to Central Pennsylvania, often working on the train to develop his design. Overlooking the Coleman’s profitable iron foundries, the unique home, reflects White’s influence from working with Richardson while drawing from his European travel sketches and his contributions to the shingle style vocabulary that would become typical of the young firm. The house itself and the interiors within had a great variety of styling seen through out the firm’s commissions in the coming years. Alden Villa or Millwood as it would be referred to was a unique formative design that reflected a young and talented architect refining his own vernacular. During the firm’s most creative period (1879-1915) McKim, Mead and White received nearly 1000 commissions, many of which are considered some of America’s most important buildings. Within the firm, Mead focused on running the office, while McKim and White were the creative minds, designing private homes, institutional and commercial commissions. Among these were estates for the cultural elite of New York, constructing villas on Long Island and Newport, Rhode Island. Highlights of the commercial and institutional commissions included the National Museum of American History in Washington DC, the Brooklyn Museum, New York University, Hotel Pennsylvania, Rhode Island State House and the New York and Boston Public Libraries among others. Birds Eye View of Pennsylvania Station, NY, NY circa 1910. The colonnades and entries to the station building were the first of three elements in the processional sequence, the portal. Detroit Publishing Company, collection of the Library of Congress. Main Waiting Room, Pennsylvania Station, NY, NY circa 1908-1910. This design was based on the Frigidarium or cold pool of the Baths of Caracalla, Detroit Publishing Company, collection of the Library of Congress. Track level and concourses, prior to completion (note panks over track area bottom left). Exact year unknown but roughly between 1908-10. This space also referenced the baths of Caracalla while acknowledging the modern methods of train shed construction. Detroit Publishing Company, collection of the Library of Congress. Unfortunately tragedy didn’t stop here, as the Pennsylvania Railroad would destroy Pennsylvania Station in 1963 at just over 50 years old. The cash strapped railroad optioned the air rights to Penn Station, calling for the demolition of the head house and train shed replacing it with a new office complex and sporting arena. Plans for the new Penn Plaza and Madison Square Garden were announced in 1962 and demolition began in ’63. 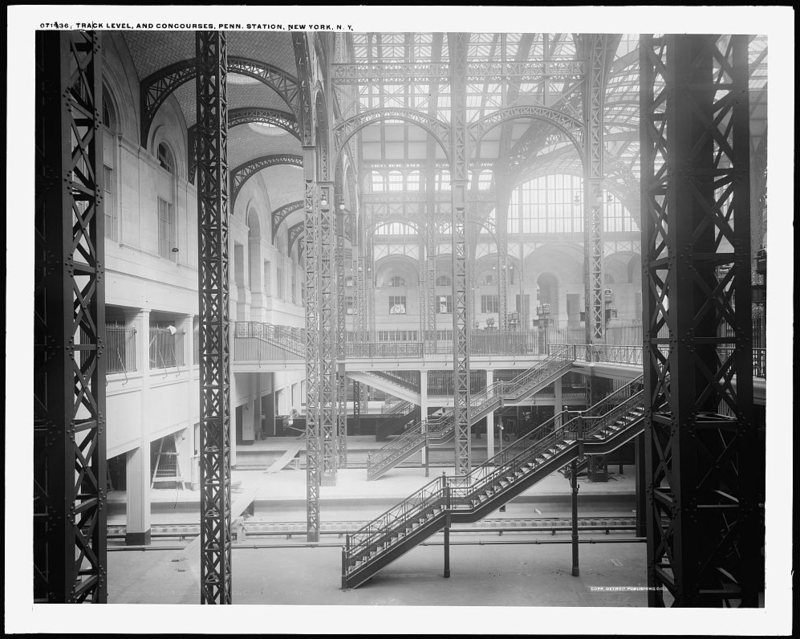 A concession for the air rights was that the Pennsylvania Railroad would receive a modern smaller subterranean terminal and 25% stake in the new Madison Square Garden Complex at no cost. What seemed to be an unimaginable act quickly took place as demolition began sparking an international outrage. While the destruction of Penn Station was allowed the act was certainly not unnoticed. Within 18 months of the demolition, New York City would enact the first landmarks preservation act in America making the lost station the poster child for historic preservation. Though a tragic end to an unwinding legacy, the legendary firm of McKim, Mead and White is survived by many of the magnificent buildings they created during their time, including Alden Villa in the village of Cornwall, Pennsylvania, a commission from the iron empire of the Coleman family of Lebanon County. Front elevation drawing of the Harrisburg Train Station. (below) Detail drawings of the fireplace and floor tile work. Drawings collection of the Historic American Engineering Record, National Park Service drawn by Harry Weese & Associates. Harrisburg was at the crossroads of the eastern system, and the largest city on the PRR between Philadelphia and Pittsburgh. From the east passenger trains originated from Philadelphia, New York City, Baltimore and Washington DC, from the west traffic came via Buffalo and Pittsburgh gateways to the North, South and West. The surviving passenger station, built between 1885-87 is the third such built by the PRR in the general area between Mulberry and Market Streets. Constructed of brick and stone, the Queen Anne style station was altered several times during the early 20th Century and featured details like facing granite and brick fireplaces in the main waiting room, coffered ceilings, wood paneling and intricate mosaic tile floor patterns. After a destructive fire in 1904, the station was completely remodeled restoring the unique gambrel roof while converting the attic space into a third floor for offices adding the eight dormers on the front (east) elevation. 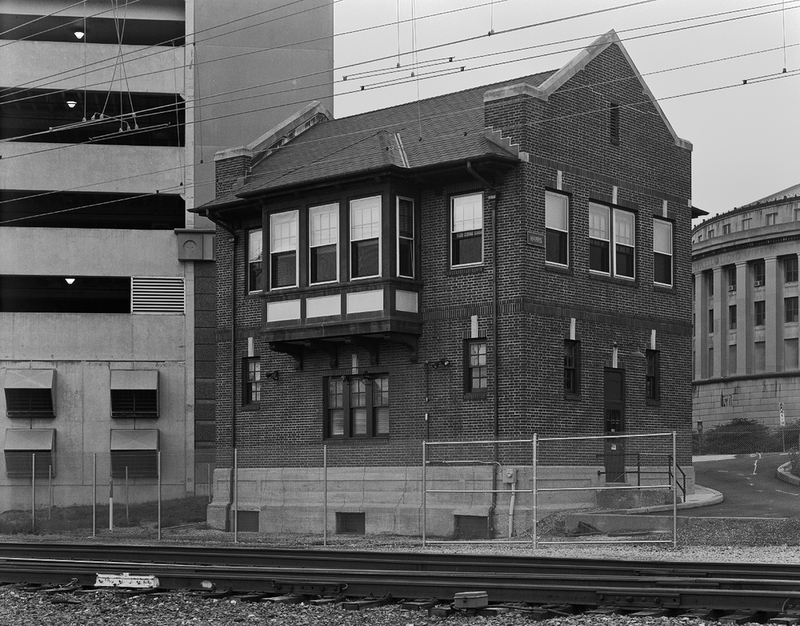 A major addition to facilitate the electrification to Harrisburg in 1936-37 added a two story, three bay extensions on the south end of the building to accommodate the new Power Dispatcher’s facility and State Interlocking. Train shed interior looking east. Notice the intricate iron work on the stair railings and trusses. The active center platform has been elevated to accommodate Amtrak/ ADA compliance needs but the remaining low level platforms are still traditional herringbone brick with stone curbs. This shed is one of few remaining examples of a style of station that was once commonplace in America. The surviving train sheds behind and to the east of the station were of even greater significance. When constructed they were considered some of the largest of its time, utilizing historic Fink trusses constructed of wood and iron to support the roof. 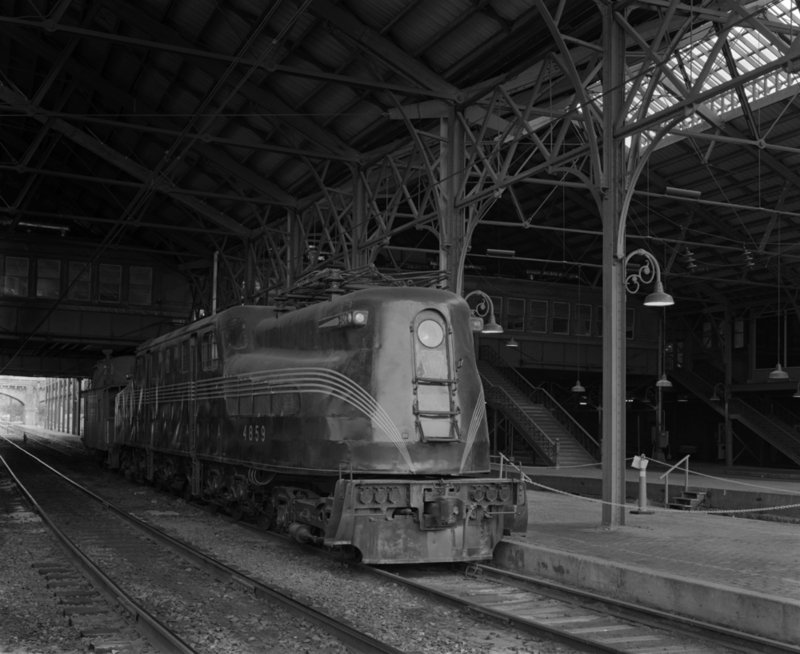 The twin station sheds were extended at various times and measure roughly 540 feet in length providing shelter to 8 of the 10 station tracks maintained in the busy terminal. View from photographer Harlen Hambright, taken during the 1981 HAER survey. 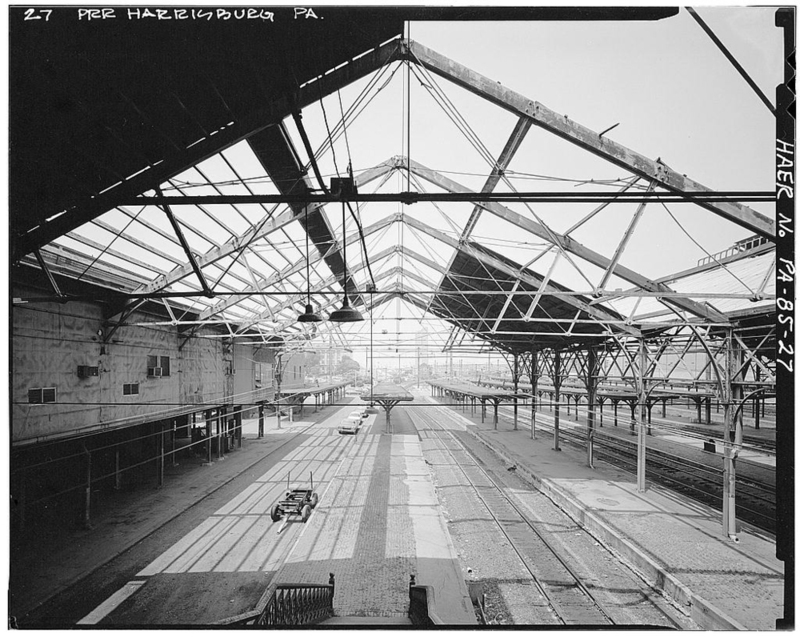 Survey caption reads "View, looking north (railroad west) under shed from concourse, showing exposed truss after shed roofing was removed." Collection of the Historic American Engineering Record, National Park Service. Current view of the south (railroad east) end of the station bound by the Mulberry Street Viaduct itself a beautiful curved concrete arch bridge. The track curving off from the bottom right is Norfolk Southern's connection with the former Reading Company Lebanon Branch, now part of the busy Harrisburg Line. The track immediately behind that and parallel to the station is the Royalton Branch which provides freight an alternate route off the Port Road via Shocks Mill, running alongside Amtrak's Keystone Line west of Roy Interlocking. Today the passenger terminal and sheds survive and are on the National Register of Historic Places and are also designated as a National Engineering Landmark. Known as the Harrisburg Transportation Center, the building serves both bus lines and Amtrak, where the Keystone Service from Philadelphia and New York Terminates, and the daily New York – Pittsburgh Pennsylvanian calls in each direction. While passenger train service is a mere ghost of what it used to be, the historic building survives as a monument of what rail travel used to be for future generations. Situated on the former #5 Station track, PRR class GG-1# #4859 resides as part of a permanent display owned and maintained by the Harrisburg Chapter of the National Railway Historical Society, also accompanied by a class N6b PRR Cabin Car (caboose to non-PRR people). The 4859 is of particular significance to Harrisburg as it hauled the first scheduled electric powered passenger train into the station in 1938. The locomotive was part of a fleet of 140 locomotives built by both the PRR in Altoona and General Electric, the ubiquitous G, was the workhorse of both the limiteds, regional and local passenger/ mail trains as well as freight on the PRR. The last operational GG-1 ran in October of 1983 and 16 survive around the US as static displays. Harris Tower avoided a fate most towers ultimately succumbed to after being decommissioned. Today as a result of dedicated volunteers from the Harrisburg Chapter of the NRHS, the 1930 built switch tower functions as a unique museum experience, providing visitors with a hands on understanding of tower operations and traffic management in golden age of railroading. 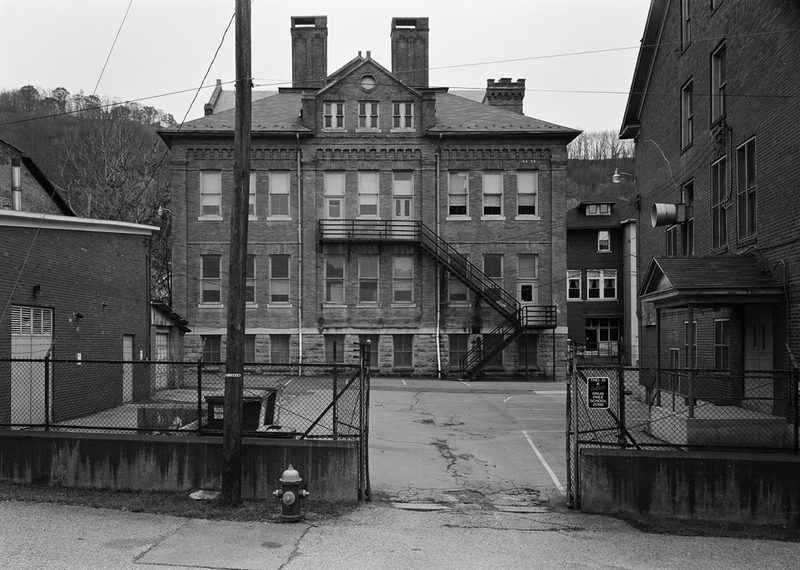 In 1991 when Harris’s remaining functions were transferred over to State Tower, the Harrisburg Chapter of the NRHS realized the significance of this building and set out to preserve the facility in place. The initial state of affairs in the old tower was pretty sad: damaged windows, a dated electrical systems, leaky roof, a defunct heating system and an interlocking machine and board that was in rough shape made just stabilizing the building a monumental task. Under the direction of Fred Wertz former Chapter President, countless volunteer hours from members of the Harrisburg Chapter (see the complete honor roll below) were logged to bring the structure back to its original as built appearance. As work progressed on the building itself, volunteers Dan Rapak and Jeff Vinton worked to restore the Union Switch and Signal interlocking machine and its accompanying model board. Rapak and Vinton worked to free the seized electro-mechanical levers while John Smith took on the restoration of the model board. A computer-controlled system was developed to operate the magnets on the interlocking machine allowing the levers and locks on the unit to once again function properly. The concept of running virtual trains was developed to make the interlocking machine a hands on exhibit which, by way of computer simulation, a given visitor can direct trains through the “interlocking” during a typical 1943 shift. The block lines, phones, teletype and indicator bell all work as if a neighboring tower was relaying train info, complete with scripts developed and read by former tower operators, announce oncoming trains as was done in typical tower operations. The Harris Tower museum is a one of kind experience for the historian, train buff and curious observer alike. Where else can you go and have a hands on history lesson on how to manage trains and control traffic in what was one of the busier towers on the PRR system? Detail of the restored interlocking machine and interior of Harris Tower. 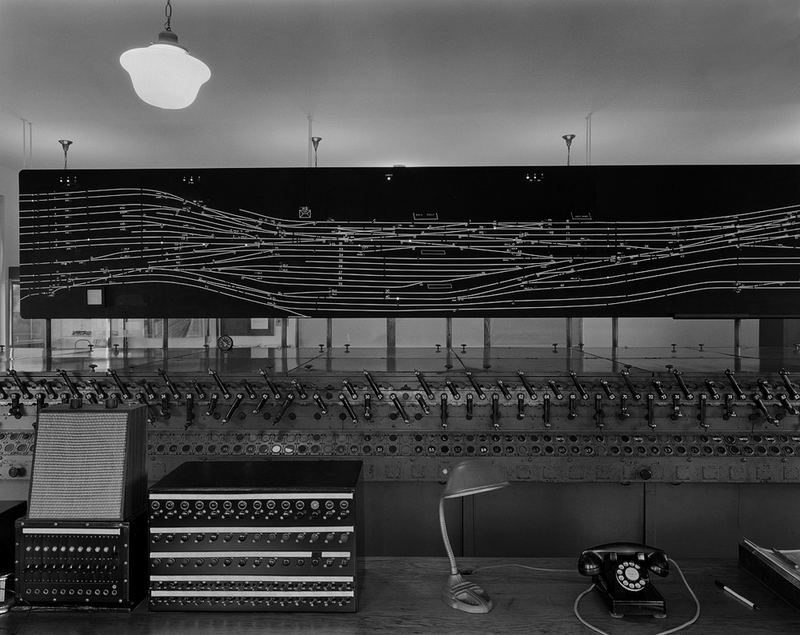 The operator and train director's desk in the foreground features a restored lamp and key control panel that provided the tower communications with dispatchers, line-side phone boxes and other interlocking towers. In the rear is the carefully restored Union Switch and Signal Model 14 Interlocking Machine and Model Board, the device by which switches and signals were controlled to route trains through the busy Harrisburg Station. Note the complexity of the track work through this junction, which was needed to route the many passenger and freight trains in addition to the countless light engine and switch moves that took place during the height of the PRR era. While we visited Harris Tower volunteer William Kcenich provided a great interpretive lesson on operations and the restoration. We were also joined by Chapter member Don Rittler who provided first hand knowledge of operations at Harris from his time as a block operator here. Don Rittler started his career with the Pennsylvania Railroad on October 11th, 1937 as a messenger for the interlocking towers on the PRR Philadelphia Division. 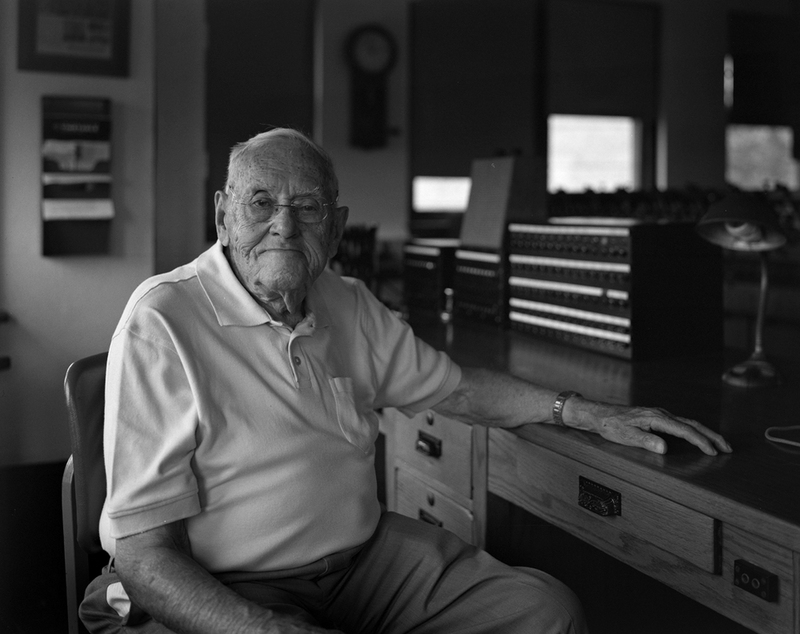 The first person to be hired since the 1927 furlough of employees as a result of the Great Depression, Don worked the introductory job spending his days relaying messages and paperwork from tower to tower as needed, gaining a familiarity to the basic operations and chain of command among the many towers on the system. On December 1st, 1940 Don posted his first position as a block operator and leverman, working the Philadelphia Division extra list, filling in at different towers. Over the years Don worked such posts as Norris, State, Harris, Cork and many others. Don Rittler who used to work at Harris as both train director and lever man, shared many great stories and insight on the daily operation of a busy tower like Harris. Don worked for the PRR for 42 years enjoying a flawless career and the camaraderie of the many people he worked with. Rittler, now 93 is still as sharp as ever and is never shy about sharing a great story or two about his experiences on the Pennsylvania Railroad. In 1944, like many other PRR employees Rittler was summoned to serve his Country in World War II. He would be part of an Army Unit known as the 775th Railway Grand Division, centered in the Pacific Theater during the height of the War. Initially working in the Philippines operating the Manila Railway the 775th would move on to Japan to be the first front if land attacks were made to secure a rail head for military transport inland. As a result of the infamous atomic bombs, their services were not needed for this purpose but they did continue to work keeping the Japanese rail systems functional. Returning to the US a short two years later almost exactly to the day, Rittler returned to work for the PRR holding tower positions as both leverman and eventually train director for State and Harris towers near the Harrisburg Passenger Station. Rittler, who’s father was a master machinist for the Pennsy in Enola was always fascinated with the railroad, as it was always apart of his life, with many friends, neighbors and family also employed by the PRR. Don and his wife built a house in New Cumberland near Lemoyne and lived a great life with their daughter Donna, sharing the family like atmosphere and camaraderie of the many railroaders Don worked with on a daily basis. Don continued to work out of the Harrisburg area well into the Penn Central era eventually moving to Conrail after the 1976 consolidation. Amtrak was slowly taking over operations on the Keystone Corridor in the mid 1970’s and Don’s choices of where to work were becoming increasingly limited. Don worked day trick at Lemo Tower, which he described as a welcome break from the busy towers he was accustomed to like Harris, finishing out a spotless 42 year career in railroading in 1979. Since retirement Don has been very gracious with his time and experience in the towers, helping the NRHS Harrisburg Chapter with the Harris reconstruction and developing the interpretive exhibit. He also on occasion visits with small groups at Harris to provide first hand working knowledge of a craft that has largely disappeared from the railroad landscape. I wish to thank Don for sharing his time and knowledge during our visit and subsequent phone conversation, for somebody who never experienced the PRR first hand, I feel very lucky to spend time with such a warm and welcoming gentleman. Special thanks to Mr. William Seigford who accompanied us to Harris and helped facilitate our visit, and of course to Mr. Kcenich who took time out of his schedule to accommodate our group from Amtrak and John Bowie Associates. In respect to the many people and countless hours bringing Harris to life again as key museum piece in the interpretive history of railroad operations I would like to acknowledge NRHS Harrisburg Chapter members and their contributions. A very special congratulations and thanks to everyone, you have raised the bar on historic preservation and interactive exhibits all the while saving a part of the great Pennsylvania Railroad for future generations. Bravo! Abe Burnette: Secured parts for model board and interlocking machine, including a reproduction machine builder's plate.Ed Burns: Interior scrapping and painting (walls and ceilings).Richard Crow: Outdoor grounds keepingTerry Gardner: Floor tile scrapping, cleaning. Personally purchased and replaced all broken and/or smashed floor tile out of his own pocket. Joseph Heffron: Handled some of the interior painting of window trim and other interior painting.Charles High: Secured jacks and headed the moving of interior racks.Bill Kcenich: Responsible for assigning, training, and scheduling all Chapter members who volunteer as, and are, Harris Tower docents.Matthew Loser: Handled the initial negotiations with Amtrak to secure ownership of Harris Tower for the Harrisburg Chapter, NRHS; also handled the registration process to have Harris placed on the National Register of Historic Places; had a Harris reproduction sign made for the Walnut Street side.Robert Lyter: Responsible for the main front door restoration and maintenance.John Pari: Scrapping, painting of woodwork and window trim.Daniel Rapak: Interlocking machine restoration and development of the simulation systems, restoration of original ceiling lighting fixtures, all interior electronics, including the securing and installation of the Seth Thomas #2 wall clock reproduction. restoration of the original dispatcher's desk and accompanying furniture.John Smith: Responsible for model board graphic restoration, the elimination of oil heat and re-installation of city supplied steam heat (as original when Harris was constructed), the removal of brick chimney (was added when oil heating conversion was done.) and personally involved with exterior renovation, i.e. power washing, new roofing, new gutters and new downspouts.Jeff Vinton: Assisted in restoring the interlocking machine and developing the simulation systems.Fred Wertz: Former Chapter President who has been instrumental since day one, overseeing building management, parts allocations and organizing monthly work sessions.Allen Wolfinger: Responsible for the removal of all interior wiring.Gary Yanko: Responsible for all building electrical upgrades, outdoor lighting, alarm system, and building insulation. Currently the Harris Tower Museum is open to the public every Saturday from now through the end of October 10 AM-3 PM. To learn more about the Harrisburg NRHS Chapter and Harris Tower, please visit their website, http://harristower.org/. One of only two surviving examples of early PRR wood frame two story switch towers, J Tower survives today as part of the interactive experience at the Strasburg Railroad. Of course it goes without say that Lemoyne Junction was protected by one of many interlocking towers along the PRR system. Built in 1885, J tower (later named Lemo) was situated in between the Cumberland Valley and Northern Central to protect the at grade crossing of the two lines in Lemoyne, Pennsylvania. The tower originally controlled switches and signals using a 35 lever mechanical machine (armstrong levers) linked to cranks and pulleys that moved the switches out on the line, subsequent upgrades modernized the interlocking plant using the standard Union Switch and Signal Model 14 electro-pnuematic plant. One of only two surviving examples of the early PRR standard design wood frame interlocking towers (the other variation being Shore Tower on Amtrak's Northeast Corridor) this tower was functioning up until the early 1980s under Conrail when the tower was removed from service. A group of volunteers with the Lancaster Chapter of the National Railway Historical Society saved the building, disassembling the structure and securing a location at the Strasburg Railroad where it would be reassembled and restored to its original appearance. In addition to the building's exterior restoration the interior would be reconstructed to its original operating configuration including the armstrong mechanical plant, parts of which were graciously supplied by Amtrak from Brill Tower in Southwest Philadelphia. Today people young and old can tour the building to gain a unique perspective of a facet of railroading that has largely disappeared in the computer age. Former Milling Complex of the Wheatena Company, ConAgra and finally Homestat Farms Ltd located off Second Street in Highspire Pennsylvania. The facility straddles Jury St, in this view looking West. To the right (North) is the milling buildings and offices, the left (South) are the storage silos. The dwellings in the background are typical of the area, resembling company homes from the nearby former Bethlehem Steel Steelton Plant. If one looks carefully there is a former Chessie Covered hopper tucked away to the left of the grade crossing in the center foreground. While most imagine massive industry along the former PRR mainline, there was significant carload business scattered along the system, whether accessed by running tracks along the main, branch lines, or industrial tracks, these small businesses are something that the Company relied on to generate revenue. Take this Milling Complex for example, we are located on what the 1945 edition of a PRR CT1000 refers to as the the Wheatena Corp. Number 1 and#2 sidings on the Old Line in Highspire Pennsylvania at milepost 186. The Wheatena Corporation, dates back to 1879, when a New York City baker began roasting whole wheat and packaging it as a cereal called Wheatena. While the product was manufactured at a Modern plant in Rahway NJ through the better half of the 20th Century, the raw wheat came from this particular location. By the 1960's, The Ulhman Company's subsidiary, Standard Milling Company purchased Whetena and the Highspire Flour Mill, moving the cereal manufacturing to the Highspire Plant almost immediately in October of 1967. Production continued into the 21st Century under later lessees and owners International Home Foods, ConAgra, and finally, William Stadtlander's Homestat Farm Limited who currently owns the Wheatena royalties and product line. As of the purchase in 2001, Wheatena products were still manufactured in Highspire and was still served by Norfolk Southern Corp, however during a recent visit, the mill looks inactive, but it is unclear for how long the facility has been shut down. Opened in 1902 under the direction of Chief Engineer William H Brown, the Rockville Bridge is the longest masonry arch railroad viaduct in the world. Built by the Pennsylvania Railroad, the 3820' long span is made of 48 seventy foot spans over the Susquehanna River, connecting the PRR Harrisburg Terminal and Buffalo Line with the Mainline West, and connection to the sprawling Enola Yard complex through a complex junction in Marysville PA. This area of the PRR was the Eastern Hub of lines coming from New York, Philadelphia, Baltimore, Buffalo, and Hagerstown, creating a westward funnel, concentrating mainline traffic to Pittsburgh and points west. While the terminal deserves more in depth coverage, the Rockville Bridge and supporting approaches particularly on the West Bank in Marysville, represent the forward thinking of PRR engineers in designing and managing traffic flow of passenger, thru freight and terminating/ originating freight without interference and delay. Today this bridge faithfully serves the Norfolk Southern Corporation seeing heavy freight traffic and a round trip of daily Amtrak NYC-Pittsburgh service trains. While the track layout has been altered over the years, changing from the original 4 track system, to three, to the current two track layout, the bridge's appearance is still just as impressive as Griff Teller's "1949 Main Lines-Passenger and Freight" commissioned for PRR advertising purposes. Located on the West side, in Marysville, is a personal favorite location, to view the traffic crossing the mile wide river. Like many, I never seem to get enough of this impressive structure, another historic piece of the Standard Railroad of the World! 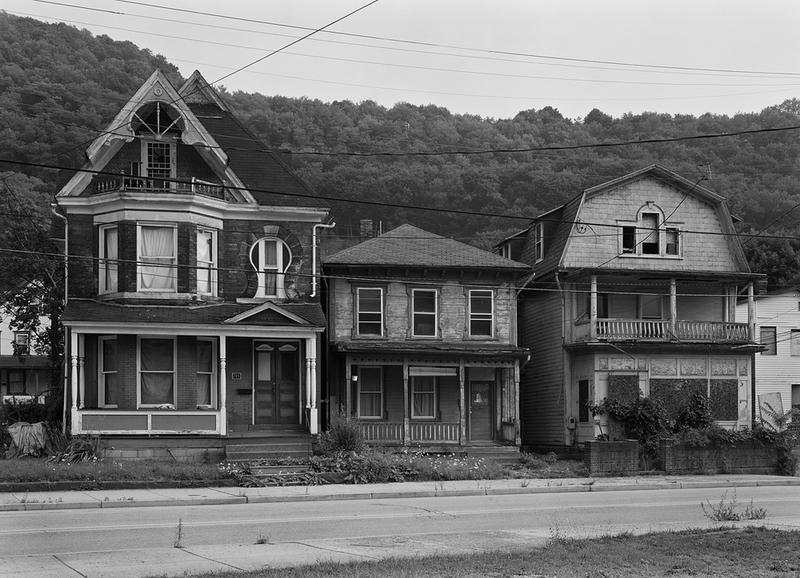 Part 6: Cambria City and the Western Suburbs: Leaving Johnstown proper, the Mainline of the PRR crosses another site associated with the history of the Great Flood of 1889. A seven span stone arch bridge over the Conemaugh River, officially know as Bridge 222 built under the guidance of Chief Engineer William Brown in 1888, was the sight of tragedy as flood waters washed across the valley, trapping over 500 people and debris, eventually catching fire and killing all but 80 in the blaze. While the structure survived the damage, over 2200 lives collectively were lost in what is still considered America’s worst natural disaster. Later, in the history of this structure the PRR modernized the bridge reinforcing it in concrete on the South Side and expanding the bridge to accommodate the four track system the PRR was know for. Today, there is more plans for the bridge with the City planning its South Side re-facing to incorporate decorative lighting for night time illumination, tying in the Point Stadium, Inclined Plane, and Festival Park, adding another visual landmark to the Johnstown Discovery Network. Eastward View of Bridge 222 from Brownstone Hill, note the reinforced concrete facade from the later expansion to a four track mainline system. This bridge continues to serve Norfolk Southern today and is planned to be restored/ refinished as an anchor for the Johnstown Discovery Network system. 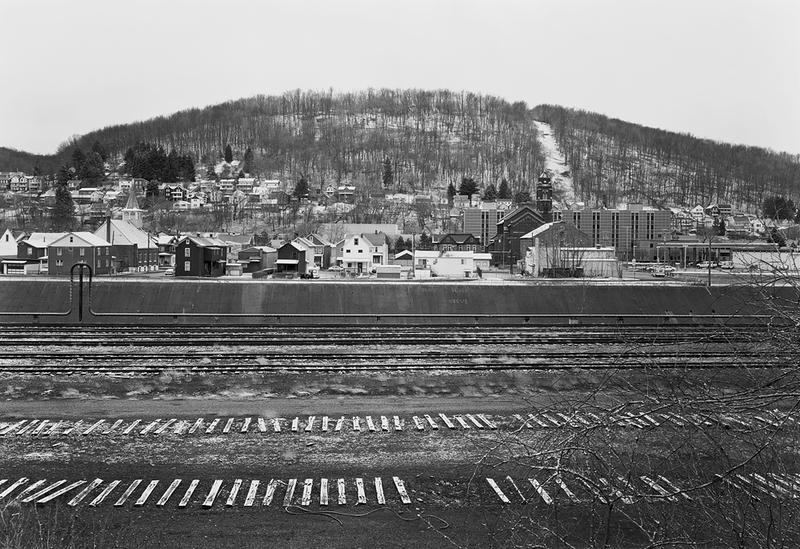 View of Brownstone Hill from the former Conemaugh and Black Lick rail yard on the North Side of the Conemaugh River. The mainline threads along the base of the mountain in the back lots of commercial and industrial buildings along Route 56 from left to right in the photo. As the Mainline again follows the Conemaugh River westward, it hugs the base of Brownstone Hill in the back lots of Cambria City. Opposite, on the North Side of the river, the C&BL takes a wondering path, servicing the area know as the Lower Works, the original Cambria Iron Works that established Steel Making in area circa 1852. While the mainline is pretty straight forward, the C&BL runs through ruins of its former self. In the neighborhood of Minersville, vacant yard trackage and a quiet engine facility, far to large to be justified for the sometimes monthly operations of today stands testament to a company railroad that once thrived on terminal switching, moving in raw materials to the mill and finished product to the PRR and B&O. Looking South East from 4th Street in Cambria City's neighborhood on the North side of the Conemaugh River, we see the Conemaugh and Black Lick Main running along the concrete flood walls that now keep the flood prone river in check. The siding diverting to the left appears to be a leg of a Wye that led to a branch extending into the hillside for slag dumping and steel waste, most likely coming from the nearby Cambria Works just out of view in the top right of this image. Further West, past the engine house the C&BL once again crosses the Conemaugh one last time on the Ten Acre Bridge to access the Wire and Rod Works in the Morrelleville Section one of the last facilities still doing what it was intended to do by Bethlehem Steel. From the North Side, a spur continues on from the locomotive shops only to be lost in the weeds along Cramer Pike. On the South Side of the River we make one more significant observation on the PRR main. At MP 277.3 stood SG tower in the Western Suburbs of town. Here interchange was conducted with the C&BL. More significantly on the mainline, tracks 1, 2, and 3 (4 split off remotely 3 miles West) divided along the South Bank, while track 5 and 6 ran along the North to Conpitt Junction some 13 miles further West. Track 5 and 6 known as the Sang Hollow Extension, was built between 1881-83 to handle heavier freight traffic through the area, eventually connecting back with the Mainline and elusive Conemaugh Line, a low grade back road into Pittsburgh, at JD Interlocking just west of New Florence PA.
Just west of SG tower near milepost 278 the Sang Hollow Extension crosses the Conemaugh on a ballasted deck bridge at the area know as Dornock Point. Along the ridge in the rear of this image, the mainline continues westward along the southern bank of the Conemaugh River. This concludes our tour of the Greater Johnstown Area, check back soon for more in depth posts on other towns related to the Pennsylvania Railroad. For more imagery from my Mainline Project please visit my website. For more information on the PRR and the neighboring landscape check out some of the links below. As a side note, I would like to thank the many deicated people that spend so much time and energy preserving, interpreting, and sharing the past, present, and future of our Railroad, Social and Industrial Heritage in this Country! Please feel free to send me more links and I will be sure to add them! Part Five: Johnstown Proper: Although Johnstown has lost a good deal of manufacturing the City still has a lot to offer including several great museums, walking tours, the historic Inclined Plane to Westmont, Point Park and a Minor League Baseball Stadium among other key features that are part of the Johnstown Area Heritage Association. Below are several images made over the past five years of the City Center, exploring both the City's relationship with the railroads as well as the landscape and architecture in general. View looking Northeast of Franklin Street Bridge across the Stoneycreek River from Somerset Street. Building on the far side is the Conrad Building which dates from 1900. View of St. Mark’s Evangelical Lutheran Church, demolished some time after this visit in 2007, for the Northrop Grumman Technology Park that now occupies the site. View from Flood Wall, Stoney Creek River and Franklin St Bridge. The church to the right is the Trinity United Methodist Church. Support tracks and an interchange yard that runs parallel to Washington St fans out behind the Gautier Works in town, illustrating the Work’s dependency on the railroad to transport both raw and finished materials from just one of the many divisions of the Bethlehem Works. Leaving the Gautier Works complex behind the C&BL crosses the Conemaugh River on a impressive through truss span, and ducks under the PRR mainline just East of the Johnstown train station. Just past the C&BL underpass is the train station the PRR built in 1916 by famous Architect Kenneth M. Murchison of New York City. Murchison is also known for his historic designs of the surviving Delaware and Lackawanna Stations in Hoboken NJ and Scranton PA as well as Baltimore’s Union Station (later known as Baltimore Penn Station for the dominate service of the PRR). The station, just recently donated to the Johnstown Area Heritage Association is intended to become a cornerstone to the downtown tourism development and provides a beautiful entry to a City on the verge of rebirth as an Industrial and Cultural Heritage Center in Western PA.
Franklin is directly across from East Conemaugh, spread in two small neighborhoods, the eastern section is stacked on the hillside overlooking the former mill and river valley, once a home to many steel workers and the actual “hot side” of the Johnstown Works. View of the eastern section of Franklin from East Conemaugh. Former PRR Mainline and Woodvale Yard in foreground. 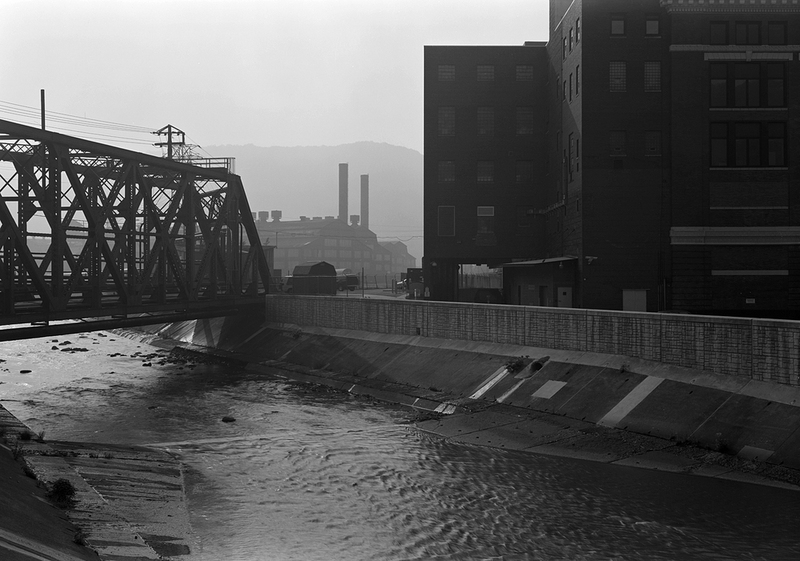 Note the Strank Memorial Bridge and old Chessie boxcar that appeared in the East Conemaugh Post last time from the opposide side of the Conemaugh River. The former blast furnace and open hearth mills of the Bethlehem Johnstown Works from the Locust St. Bridge in Franklin. Note the C&BL lead that used to provide rail service into the mill. Further West, down Rt 271, heading South West, you cross the Conemaugh River and enter the western end of town, including a small area of housing and churches that also was home to the Rail Car Division later spun off to FreightCar America Works, which was to become one of the last remaining steel related manufacturing facilities of the former Bethlehem Johnstown Works. Car Wash and St. John the Baptist Church from Jasper Alley. Various freight cars waiting for work at the Franklin Railcar America facility. In 2008 the works closed its doors, taking much need jobs and tax revenue from this struggling little town. As of the Fall of 2010, the facility was being leveled, ending hopes of manufacturing jobs that were once plentiful in a small town with big industry. Stored tank cars awaiting reconditioning. The weedy yard and empty tracks of the C&BL interchange yard speak of the impending shut down of Railcar America facility which happened in 2008. The railroad maintained facilities here including Woodvale Yard, access to the Johnstown branch and interchange with the Conemaugh and Black Lick RR, the Baltimore and Ohio Railway, and a engine terminal that supported both local operations and helper assignments that assisted Eastbounds on the ascent of the Allegheny escarpment. View looking toward East Conemaugh. 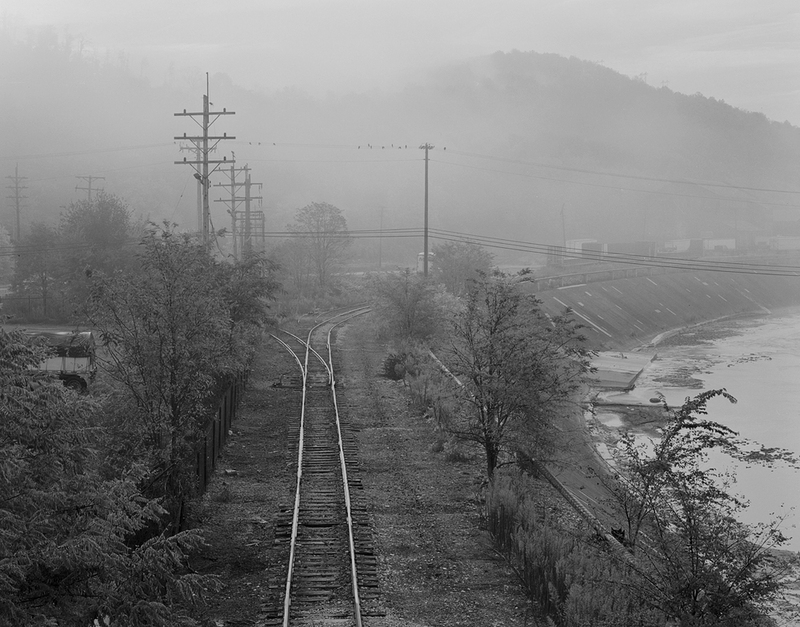 Taken from the Town of Franklin, Conemaugh and Black Lick trackage is in the foreground, the River, and finally the PRR and East Conemaugh nestled along the distant ridge. The bridge to the right is the Strank Memorial Bridge which is soon to be replaced. The town itself, like many other smaller Pennsylvania towns, is a unique assortment of original buildings, signage, and character, void of the congestion, shopping malls, and the box store epidemic of suburban sprawl. Small businesses flank quiet side streets that run parallel to the former PRR Mainline and Woodvale Terminal. This is a view from Davis Street between Cherry and East Railroad St. The town’s design speaks of its relationship to the railroad, how the commercial center borders just blocks off the railroad tracks, becoming more residential as you progress further up the hill. Hand painted signage, beautiful old examples of small town architecture and community churches dot the landscape. Former First National Bank Building, 300 Block of Greeve St.
Church of the Living God, Cambria Street, with residences on neighboring Heritage St. to the right. 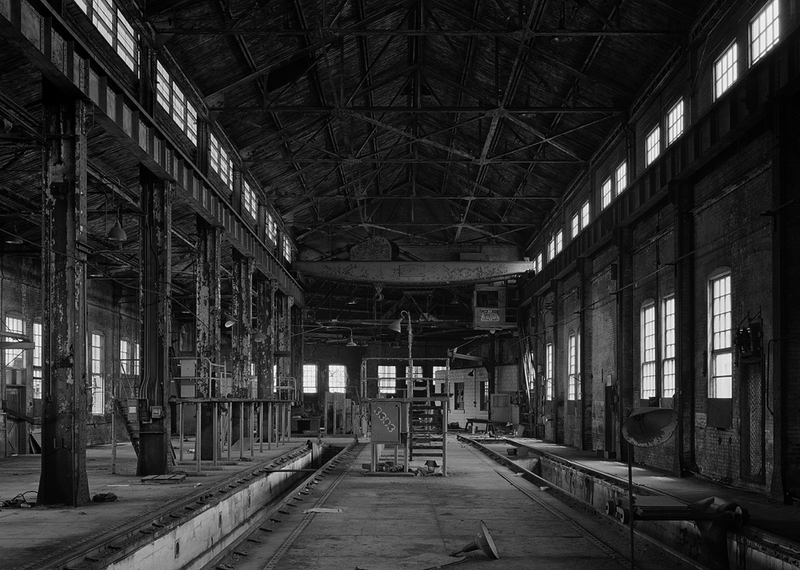 Interior view, heavy repair and machine shop of the former McKeesport Connecting Railroad. Not far off the beaten path of the PRR, in the steel producing areas around Pittsburgh along the Monongahela River Valley, was a small industrial railroad that was incorporated in 1889 to build and service the McKeesport - Port Perry line that was held under capitol stock by the National Tube Works of New Jersey. The railroad was a terminal company who's primary role was to support operations of its owner's mill and make outside connections to the B&O, Pittsburgh and Lake Erie, Union Railroad, Bessemer and Lake Erie and PRR. Transferred to US steel in 1942 and later, outside contractor Transtar Inc, the company became part of the larger Union Railroad conglomerate that still serves predecessor Camp Hill Corporation making pipe with materials supplied from the US Steel Irvin and Gary works for both the water and gas industry. In addition the Union Railroad still serves the region's remaining coke production facilities in Clairton, the sprawling Edgar Thompson Works in Braddock, and finishing mills in Irvin with interchange to all major class one railroads in the region.While the Union Railroad has consolidated maintenance facilities to the Monroeville area shop complex, the original 1906 McKeesport Connecting RR shop and roundhouse still stand in the company's namesake town, open to the elements and quietly rusting away, another relic of steam era architecture that could be lost in time. Detail of equipment bins in the former roundhouse area which appears to last be used for car repair, tool, and parts storage. View of powerhouse and neighboring coach yard facilities prior to demolition. View of powerhouse and neighboring coach yard facilities prior to demolition. 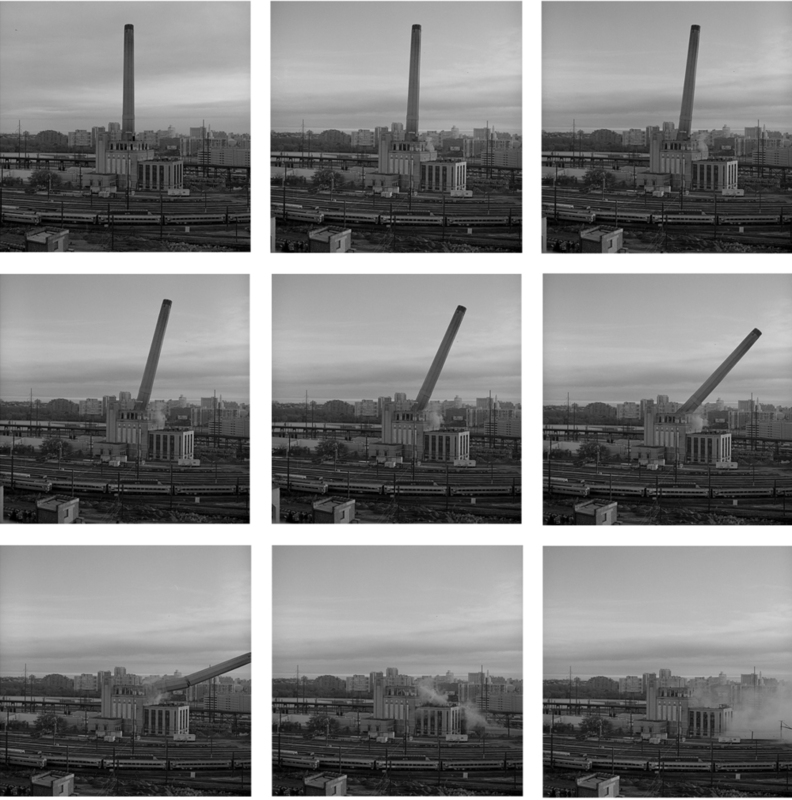 On November 15th, 2009, the 425 foot tall chimney of the Penn Coach Yard Power Plant, built for the former Pennsylvania Railroad, was demolished after standing prominently on the West Bank of the Schuylkill River since the late 1920's. It was part of a power plant constructed to provide steam and power for the massive coach yard and roundhouse complex that was part of the massive Philadelphia Improvements Project taken on by the Railroad and City Planners to redevelop Center City, phasing out Broad Street Station and introducing Pennsylvania Station for through passenger service connections. Designed by Graham, Anderson, Probst and White and constructed in 1929, the facility was built to accompany Pennsylvania Station which was also built by the same firm. The structure was similar in design without some of the more elaborate details that the beautiful station still shows today. The power plant was used into the 1960's until decommissioned and for many years, was left neglected and vacant as the building changed hands from the PRR to the ill fated Penn Central Merger, development of Amtrak and later South Eastern Pennsylvania Transportation Authority (Septa). Several discussions surfaced over the years to redevelop the facility as a condominium and mixed residential district, keeping the historic building as a centerpiece of the new project. Unfortunately, after many ideas and proposals, it was decided to bring down the building for what Amtrak considered a security risk among other concerns. Sadly what will take the building's place will be a parking and storage facility for the local Amtrak maintenance of way base, located between Septa's Powelton Ave Coach Yard, the elevated freight bypass know as the Highline, and Amtrak's Penn Coach Yards. In the early hours of Sunday November the 15th, many came out to watch the massive stack be "dropped" to the south onto the neighboring Pullman Commissary another historic structure that fell victim during this project. Over the following weeks the remaining power house was taken down with heavy equipment and a wrecking ball forever removing a piece of railroad and industrial history from Philadelphia's skyline! In the company of former PRR Silverliner cars, we see the remaining moments of the unofficial "Drexel Shaft" as it drops to its final resting place. Duncannon is a quiet little riverside town that sits just below the confluence of the Juniata and Susquehanna Rivers in Perry County Pennsylvania. Along the banks of the Susquehanna runs the Middle Division of the former Pennsylvania Railroad. Above, we see the view from Cumberland Street looking East toward the former Passenger Station on Water Street. The beautiful brick and wood design is similar to neighboring Marysville, and Newport stations both of which survive today.